First Row: Ens. Lawrence Isaacs (fifth from left); Ens. James Reilly (sixth from left); Lt. Kenith Lindstrom (seventh from left); Lt. K.G. Nichols (eighth from left); Comdr. 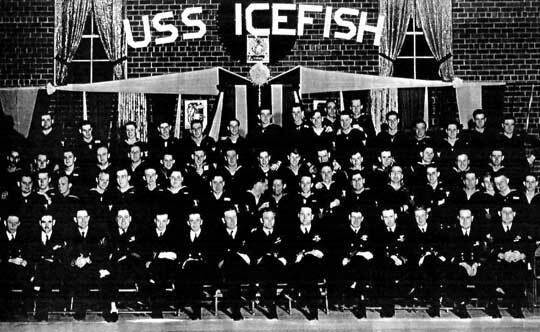 Richard Peterson (ninth from left); Lt. Comdr. Walter Small (fifth from right); Lt. Samuel Clark (fourth from right); Ens. Paul Schauer (third from right); CMoMM Joseph Norris (second from right); and CTM Frank Liberty (far right). Second Row: GM1c John Benson (fourth from left); S1c John Chivis (tenth from left), and RT2c Reuben "Benny" Anaforian (seventh from right). Third Row: S1c Julius Masinick (third from left); S1c John Morgan (tenth from left); S1c Raymond Nottke (twelvth from left); and EM3c William Seay (third from right). Fourth Row: TM3c Marshall Olson (second from right); TM3c Jose Gomez (third from right); S2c Thomas Jones (fifth from right); TM1c Harry McKinnon (sixth from right); TM3c John Roche (sixth from left); and TM3c Emil Mrazovich (seventh from left).